Setting the record straight on the driving forces in the early-20th-century fight for women’s suffrage. Former Los Angeles Times and USA Today journalist Neuman (Scholar-in-Residence/American Univ. ; Lights, Camera, War: Is Media Technology Driving International Politics?, 1996, etc.) counters the popular opinion that these women were merely “bored socialites trying on suffrage as they might the latest couture designs from Paris,” and she makes a solid case. They sought the vote as a marker of educated privilege, and many were mocked, termed spinsters, lesbians, and intellectuals. If that was their loudest obstacle, female indifference was their silent enemy. 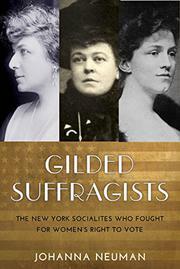 Success was slow; by the century’s end, only four states had granted women the right to vote. In 1907, Daisy Harriman and others opened the Colony Club, New York’s first club exclusively for women. The members included 700 women prominent in professions and society, and they debated a wide variety of subjects—not just pro- but also anti-suffrage, the arts, and matters of civic and social interest. A new generation of women of wealth and standing stepped up in 1908, most notably Alva Vanderbilt Belmont and Katherine Duer Mackay. Belmont, who was domineering, audacious, and independently wealthy, used the newfound celebrity journalism to manipulate the press for the movement. Mackay used her femininity and famous fashion sense to approach the elite and influence the influential. She taught women to take a ladylike, maternal purview to the public square, eschewing the violent methods seen in Britain at the time. Where Mackay offered a coy wink, Belmont employed a cold bribe, but they each succeeded in pulling the movement out of the doldrums. Though mockery continued, Belmont, Mackay, and others made fruitful use of their considerable contacts, making New York the center of activity and encouraging cross-class coalition. Neuman concisely explains how these gilded women have been airbrushed out of history, resented by those who felt exploited, but thankfully, they succeeded, and women vote today because of them.